One of the most significant events of the Second World War – and an event that would forever change the course of history thereafter – was the fact that atomic bombs were used for the first time. 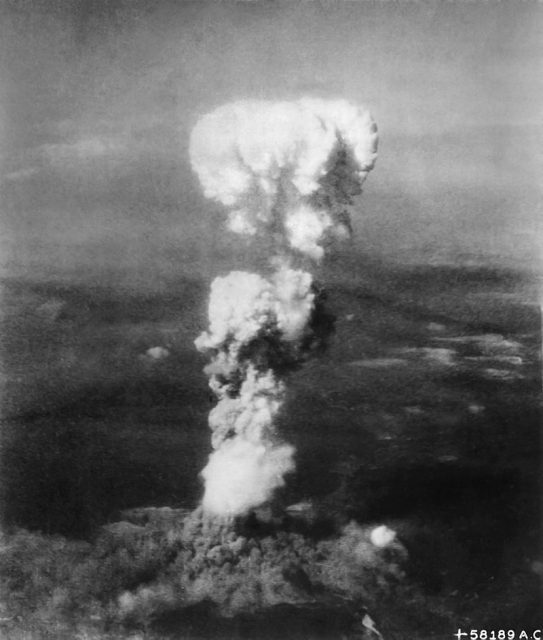 On August 6 and 9, 1945, the United States dropped two atomic bombs on Japanese cities. The first fell on Hiroshima, and the second fell on Nagasaki. The destruction caused by these two bombs was unprecedented in human history. 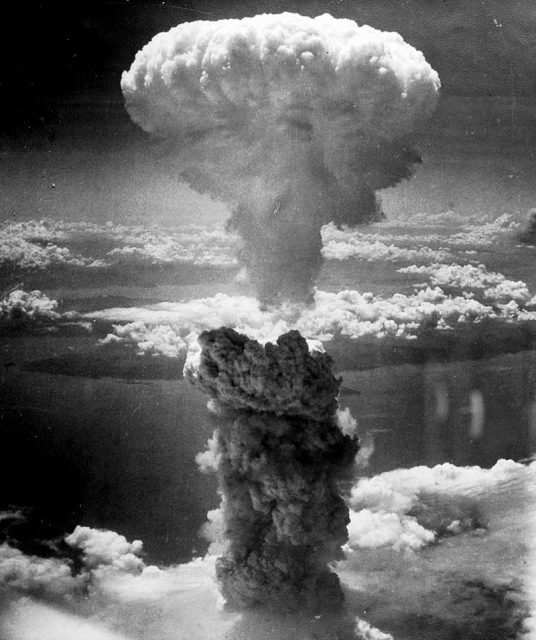 When the first bomb, Little Boy, detonated upon landing in Hiroshima, between 60,000 and 80,000 human lives were wiped from the face of the earth in the space of a second. Everything in a mile radius from the center of the blast was flattened, with temperatures in the immediate vicinity reaching almost 4000ºC (7232ºF), turning every living being to vapor. Tens of thousands more would die in the fires that spread through the city, and from radiation sickness, in the days that followed. 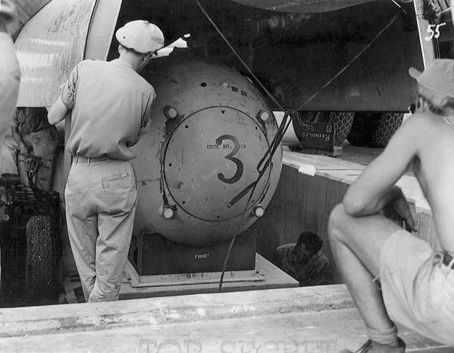 Little Boy in the bomb pit on Tinian island, before being loaded into Enola Gay’s bomb bay. A section of the bomb bay door is visible on the top right. 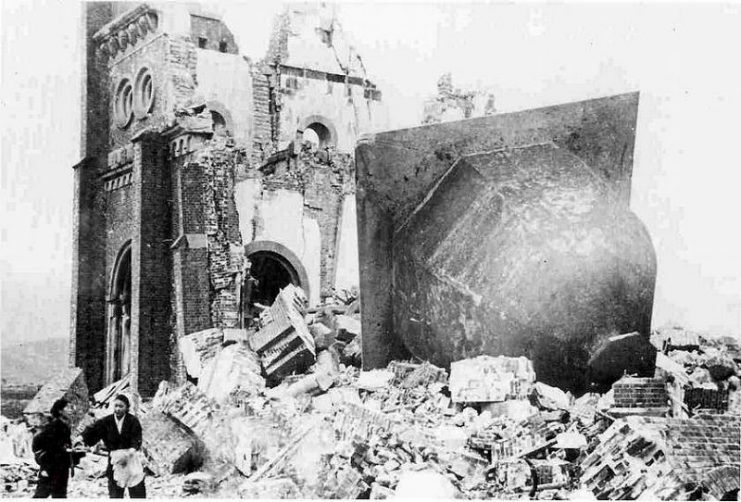 Three days later another bomb, Fat Man, was dropped on Nagasaki, with similar effects. One man, Tsutomu Yamaguchi, was unlucky enough to be in both cities at the time that the atom bombs were dropped on them – and, amazingly, lucky enough to not only survive both blasts, but to live to a ripe old age. Yamaguchi was born in 1916 in Nagasaki, where he grew up and qualified as a draftsman. He began working in the 1930s, when he was employed by Mitsubishi Heavy Industries to design oil tankers. 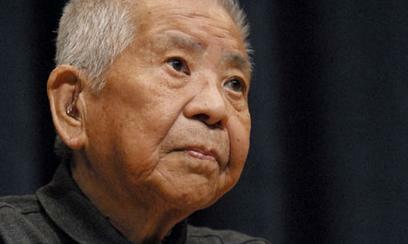 It was this work that took him to the city of Hiroshima on that fateful day in August 1945. He almost got out of the city before the atomic bomb was dropped on it. Yamaguchi and his colleagues from Mitsubishi had been in Hiroshima for three months, and were scheduled to return to Nagasaki on August 6, the day the atom bomb was dropped on Hiroshima. He and his two colleagues headed out early that morning, but before they got to the station Yamaguchi realized he had forgotten his hanko (a travel stamp) and returned to get it. When he was walking near the docks around 8:15 AM, he saw an American B-29 bomber (the now-famous Enola Gay) dropping something onto the city. The next thing he recalled was seeing a incredible flash of light across the sky, which he described as looking like “the lightning of a huge magnesium flare,” and then being hurled off his feet and up into the air by a tremendous force. 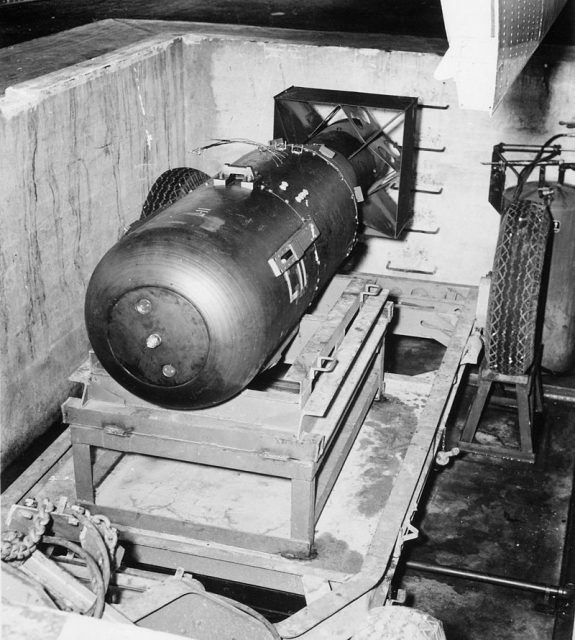 The first atomic bomb ever used in war had just exploded two miles away from him. Even at this distance, the blast blew out both of his eardrums and left him temporarily blinded, and gave him severe burns across the left side of his body. Despite being so badly wounded, he managed to crawl to a bomb shelter, where he had his wounds dressed and spent a few hours there resting and recovering. He then went out to find his colleagues, Kuniyoshi Sato and Akira Iwanaga – who had also, by some miracle, survived the explosion. They stayed overnight in an air raid shelter, and then prepared to return to Nagasaki. Their journey through hell, though, was far from over. A pumpkin bomb (Fat Man test unit) being raised from the pit into the bomb bay of a B-29 for bombing practice during the weeks before the attack on Nagasaki. The men heard that, somehow, the trains were still operating, so they resolved to get to the train station, which was some distance away. Much of the city had been outright flattened, and their journey through this urban wasteland of ruined buildings, countless corpses, some ripped to shreds and others burnt beyond recognition, out of control fires, and a sky that was black from the smoke and debris thrown up through the blast, must have made it seem like the world itself had come to a fiery end. Most of the city’s bridges had been annihilated in the explosion, and Yamaguchi and his friends had to swim across a river that was choked with dead bodies, pushing through the horror of burned human and animal corpses. They finally made it to the train and got back to Nagasaki, no doubt immensely traumatized by everything they had been through at this point. When Yamaguchi got home, he was so badly burned that at first his family didn’t even recognize him. Nevertheless, on the 9th, he insisted on going back to work, despite his injuries. This stint at work, however, was destined to be short…very short. 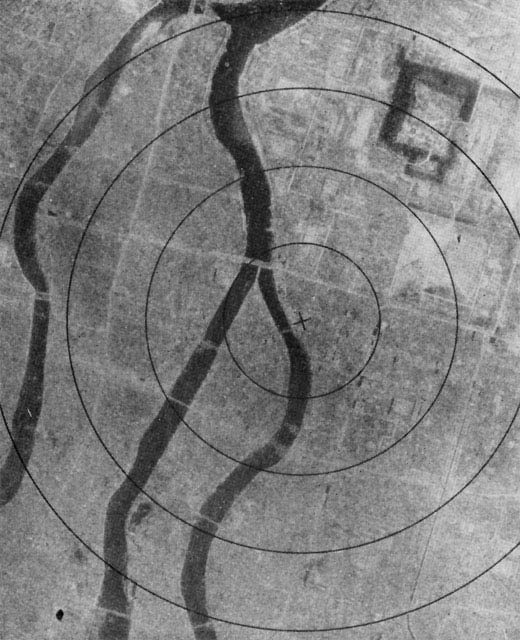 At 11 AM, while describing the explosion at Hiroshima to his supervisor, another American bomber flew over this city, carrying a similarly destructive payload: the second atom bomb, Fat Man. 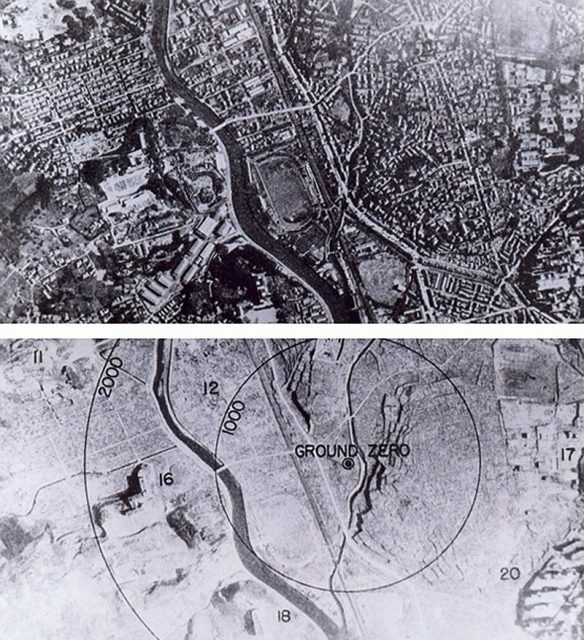 This time was Yamaguchi was around two miles from the center of the blast, but owing to Nagasaki’s topography (it was not flat, like Hiroshima) he was not significantly injured from the explosion, even though it did blow out the windows of his office and knock him off his feet. His first thoughts, upon realizing that he had survived another nuclear blast, were of his wife and baby. He rushed home through the destruction and apocalyptic madness, and his heart sank when he saw that their house had been demolished by the blast. However, his wife and child turned out to be fine – she and the baby had gone out to look for burn ointment for his wounds, and had hidden in a tunnel when the bomb was dropped. Strangely enough, it was Yamaguchi’s experience of surviving the bomb at Hiroshima that indirectly led to his wife and child surviving the blast at Nagasaki. This didn’t mean that Yamaguchi was in the clear, though, for he had his physical woes with which to contend. Affected by radiation sickness, he spent the next week with a high fever, vomiting constantly. His burn wounds became infected, and for a time it seemed as if, like so many others who had survived the initial blast, that he would die from radiation sickness. However, against all odds he made a recovery. 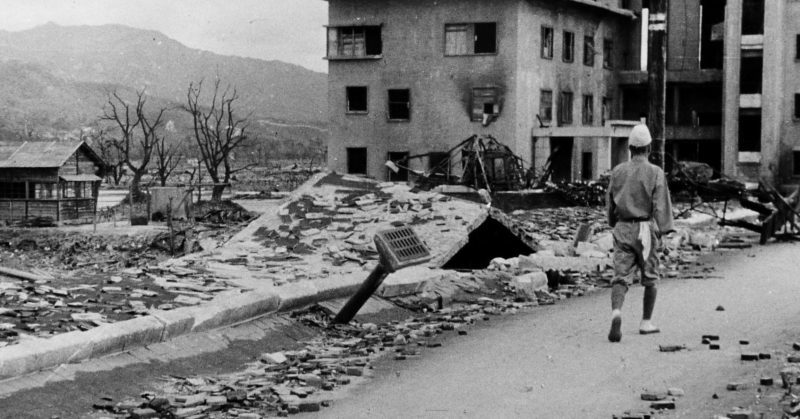 While it is estimated that around 165 people survived either the Hiroshima or the Nagasaki blasts, Yamaguchi is the only one of these who was officially recognized by the Japanese government as a nijyuu hibakusha – a “twice-bombed” person. To deal with the immense trauma he suffered, Yamaguchi took to writing poetry and, while refusing for many years to talk about his experiences, eventually wrote a memoir late in his life about the bombs. He became an outspoken opponent of nuclear weapons, and spoke in front of the United Nations in the 2000s, pleading for nuclear disarmament. Yamaguchi and his wife, who also suffered from radiation sickness, each miraculously lived until the ripe old age of 93 – unlike the vast majority of Japanese citizens who experienced the blasts at Hiroshima and Nagasaki, and whose lives were cut so tragically short.